Peach oolong has a sweet floral peach aroma that evokes images of warm summer days. This high altitude Taiwanese tea starts off with a light floral flavor that quickly develops into a natural white peach flavor that lingers. Peach Oolong is a refreshing smooth bodied tea that works well iced or hot. Add some brown crystal sugar for a sweet desert-like treat or drink plain for a more natural flavor. Our Peach Oolong is good for multiple infusions. Peach Oolong from Butiki Teas…another flavored Oolong from a company I would suggest to ANYONE looking for good-solid-flavored Oolongs…Butiki Teas! This tastes JUST LIKE White Peaches…Sweet and juicy…just the way I like ’em! If you like Peach – try this! If you are looking for a nicely flavored Oolong…TRY THIS! 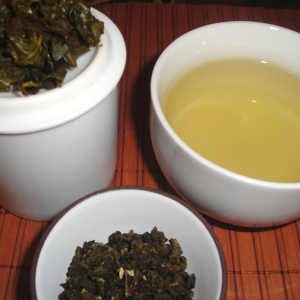 It’s squeaky clean, highly flavored, and totally YUMMY, and still true Oolong! YUM! It also leaves a pleasantly sweet aftertaste and I think it’s just lovely!